makes sense given that theta is being mixed from higher up. SCAM: Increases sensitivity to dryness just above the boundary layer, but simulation is much more noisy with strong stablization/destablization periods. SCAM: There was not much sensitivity in the mean simulation. SCAM: Rdeuced excessive buoyancy in the PBL due to the TPERT contribution during daytime conditions. However, there was still a lot daytime max precipitation not observed. CAM: As L26_parcel_nrg01, but now including the level below the LCL in the KEPAR assessment. In addition there is an additional dependency of PE->KE efficiency depending on whether there is +ve or -ve buoyancy. 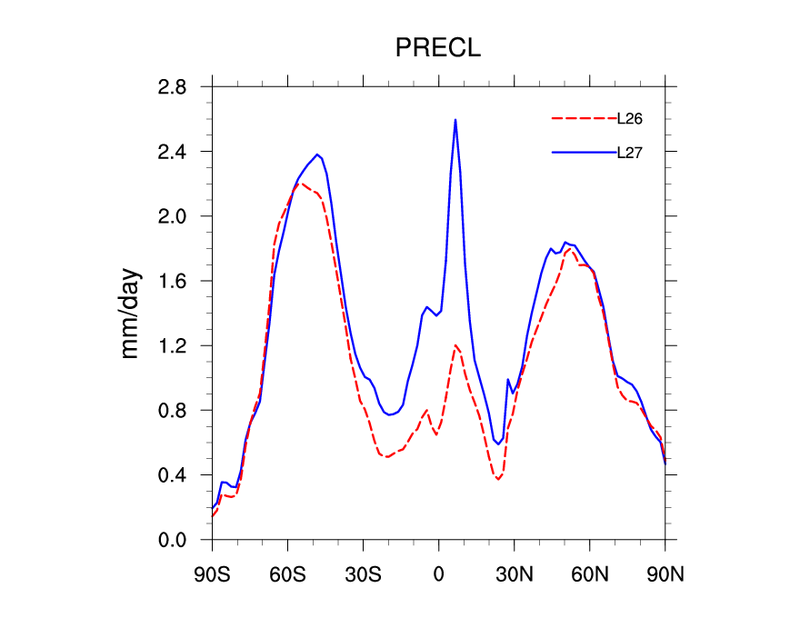 CAM: cam_conv_02 As L26_parcel_nrg01, but now including the level below the LCL in the KEPAR assessment. In addition there is an additional dependency of PE->KE efficiency depending on whether there is +ve or -ve buoyancy. SCAM: The effects are trivial (<< 1 J/kg) for even the strongest ascent. No point in doing a full CAM simulation. SCAM: Increases the sensitivity to the presence of cloud but in a too jerky manner such that it is either high entrainment or low entrainment from one timestep to the next. This is probably because there is no consideration of cloud fraction in the calculation. Maybe worth a CAM run. SCAM:Reduces TMQ by 1-2mm over land but has a minimal effect over tropical ocean. 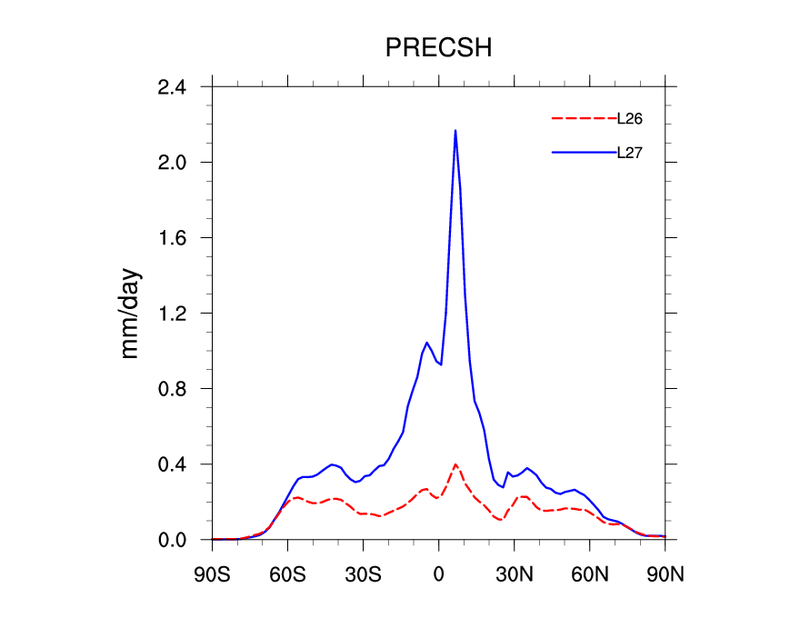 There is a transfer of rainfall away from shallow to deep. Not really worth a cam run at this stage. CAM: Some effects on the sub-tropical periphery, but otherwise quite minimal. SCAM: Minimal effects over land: Decreases average buoyancy, Increase PREH2O by at least 1mm. CAM: Not worth a run. Over land: PREH2O and PRECT strangely increases due to less frequent, but stronger events (good). T,q averages better in dry environment. CAM4 dev 06 - Convective parcel temperature excess. Change the temperature excess used for the initial convective parcel (CAM3.5 = 0.5 K in agreement with Tiedke). Change to 2 K.
CAM4 dev 07 - Add convective gustiness due to TOTAL precipitation. From the Redelsperger et al. (2000, J. Clim.) paper add the functional from of the relationship between precipitation and convective gustiness from the TOGA-COARE. Then add the gustiness to the lowest model level wind (ubot,vbot) for surface flux calculations. SCAM: Increases lhflx markedly in TOGA and GATE. CAM: Improves distribution of precipitation in the western Indian Ocean and in the Western Pacific. But overall precipitation is still too high. LHFLX is about right in the tropics but still way too high in the sub-tropics. 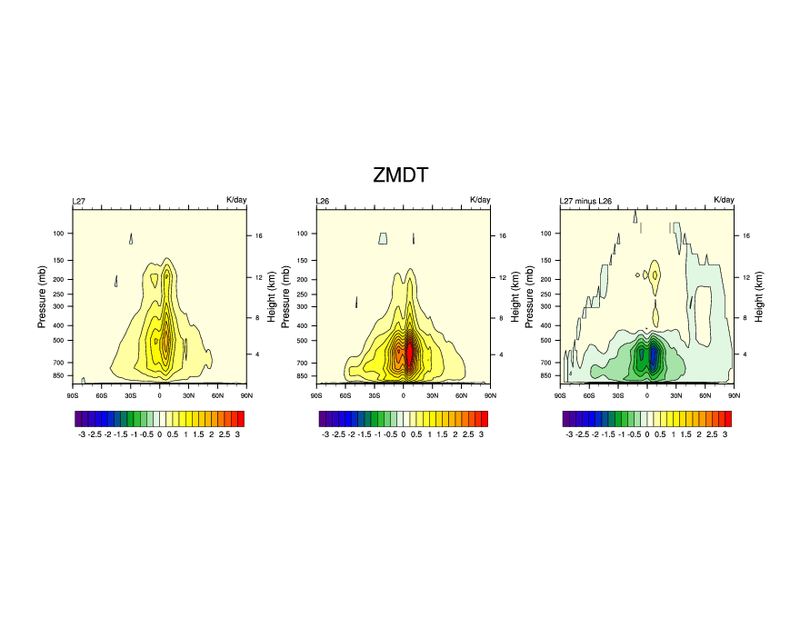 CAM4 dev 07a - Add convective gustiness due to convective rainfall only From the Redelsperger et al. (2000, J. Clim.) paper add the functional from of the relationship between convective rainfall and convective gustiness from the TOGA-COARE. Then add the gustiness to the lowest model level wind (ubot,vbot) for surface flux calculations. yrs 1-5 Control w/ Obs. CAM4 dev 08 - Add convective gustiness due to cloud base convective updrafts. From the Redelsperger et al. (2000, J. Clim.) 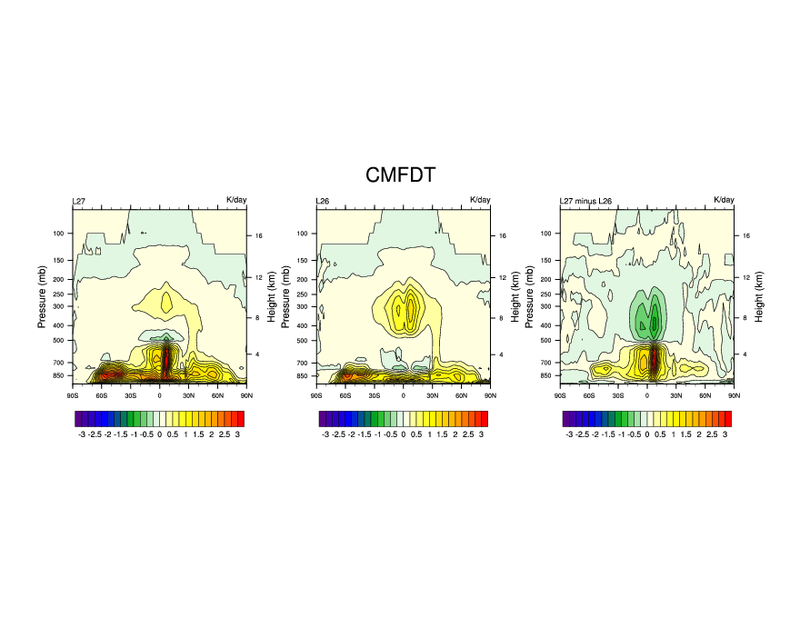 paper add the functional from of the relationship between convective updrafts and convective gustiness from the TOGA-COARE. The add the gustiness to the surface wind for surface flux calculations. CAM4 dev 09 - Add convective gustiness due to convective downdrafts. From the Redelsperger et al. (2000, J. Clim.) paper add the functional from of the relationship between convective downdrafts and convective gustiness from the TOGA-COARE. The add the gustiness to the surface wind for surface flux calculations. Detrainment of the updraft is able to begin below the minimum saturated moist static energy level. Mutiply tpert by a factor of 2 for the purposes of the convective parcel temperature.